Clina Polloni was born and raised in Chile. After graduating from the University of Chile in 1972, moved to Raleigh, NC. Clina’s love for the arts began when she was a child and was influenced by her great grandfather, Antonio Polloni, who was a celebrated Chilean painter. Clina lives with her husband Thomas C. Allen at “The Marigold Plantation” in Franklinton, North Carolina. In this beautiful farm is where she has her art studio, exhibiting her paintings and providing painting classes. Her colorful oil paintings are inspired by her love for people, animals and nature, expressing her art through the canvas in oil painting. Clina enjoys impressionism as well as realism and was able to develop her own unique style. Equally at ease portraying the people of this land, surrounded by spectacular blues of the skies as well as a rainbow of bright colors. Clina’s art has been exhibit in many places, including The North Carolina State Capital. Teaching is something that fascinate Clina. 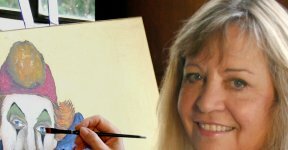 Clina offers private and group painting classes. To be able to transfer all this knowledge of art, of accomplishment after finishing a painting, to see the joy of the students admiring their work. This is her biggest satisfaction. When teaching, she likes to talk to the student, learn what is inside their feelings, what do they want to express in a painting. Through the painting process she teaches them painting techniques, color mixing, perspective, light and shadows, proportions in forms, drawing and much more. To develop their imagination and in the process their creativity.